Gilmar Smith Takes Platypod Ultra Into the Kitchen: We Burned the Cookies, But Made Awesome Memories! While the rest of my friends are taking their Platypod Ultras to exotic locations around the world, here I am again, putting my Platypod to the test, taking it to the hottest spot in my house -- my oven! I had the greatest, outdoorsy idea for this week's picture with my Platypod, but that included blue skies, and we are on our 17th day in a row with rain in Orlando, Fl (that's what Florida summers are like) and let's say, the prop I needed wasn't available at the moment. So, my creative and always-hungry mind decided to take this week's project into the kitchen! 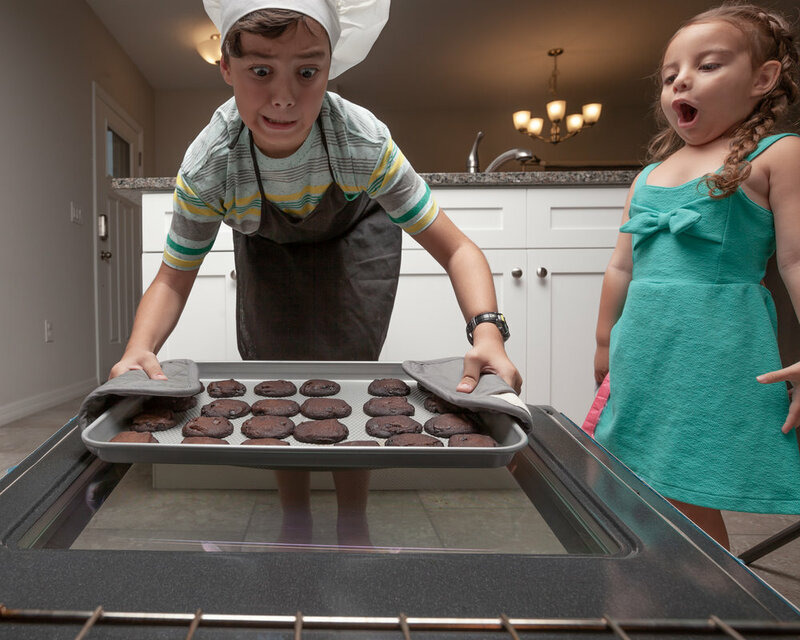 Cookies were sacrificed (roasted) for the sake of making you laugh and giving the picture a better story. I know now, the burnt smell in my house will stick for a few days. Now, Let's talk about the logistics of this shoot. My camera was on my handy Platypod Ultra, and I put it as far back in the oven as I could (please, don't stick your camera in a hot oven, just wait for it to cool down, as I did). I used a wireless remote, and I shot tethered so I could see the images I was getting. Lighting was a little bit of an issue. I first tried mounting a flash on my camera, but the light was so flat and dull. So, I went ahead and brought a strobe and an Octabank and placed it right above my subjects. I had a second light placed behind the kitchen island facing up to bounce a little bit of light around, but I ended up turning it off because I didn't like how it looked. Then, I sat with my kids and talked to them about the idea I had in mind for the final image. I love how they are always game to be part of all of these projects, and how they nail their expressions every time. We shot a few pictures for about 5 to 10 minutes and we were done. Here are some of the shots we got. I absolutely love how they play their parts. My little girl is only 3 years old; I see an Oscar in her future! 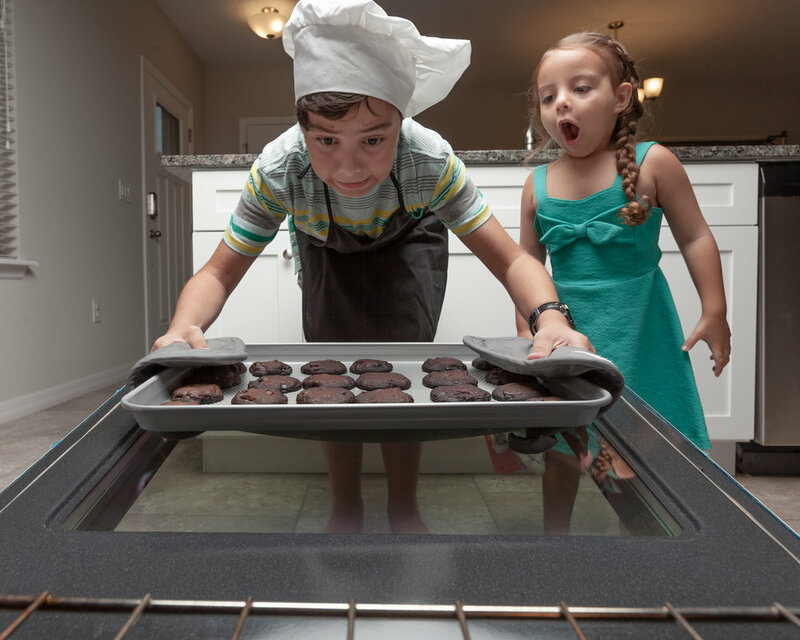 Kids and Cookies photo shoot! 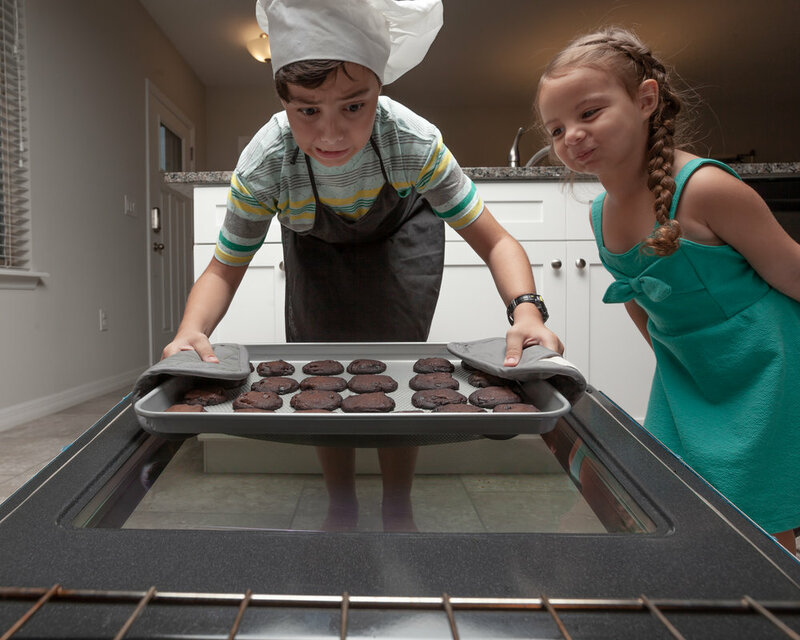 Kid and Cookies photo shoot! When it comes to post-processing, the most important part was adding smoke coming out of the oven and of course, on the burnt cookies. I did a lot of Dodge and Burning to exaggerate my kids' expressions and to give the picture a kind of cartoony look. I desaturated the image quite a bit, and then color graded it. Gilmar Smith is an Orlando-based photographer, content creator, Photoshop addict & social media junkie! Visit her at gilmarphotography.com and be sure to follow her on Instagram!